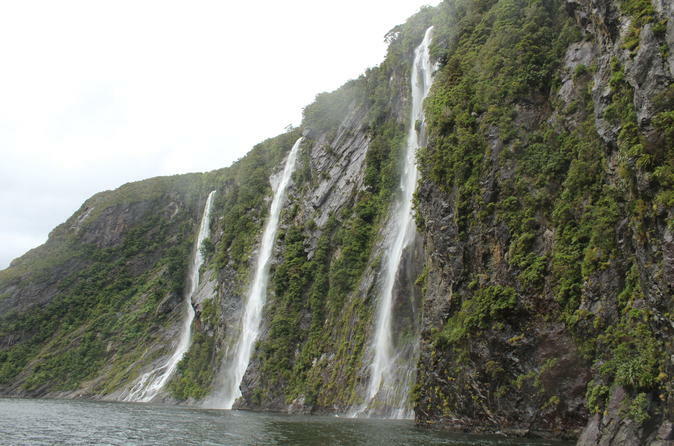 Declarado Patrimonio de la Humanidad por la UNESCO, Milford Sound es el icono de la isla Sur de Nueva Zelanda: un espectacular fiordo rodeado por escarpados acantilados y cascadas. Este crucero de 2 horas le llevará a los principales puntos de interés, le mostrará las espectaculares vistas de Bowen Falls, Sinbad Gully y el Monte Pembroke, sin olvidar el imponente Mitre Peak y bordear la costa del mar de Tasmania. Desplácese por sus propios medios hasta el centro de visitantes de Milford Sound en el Parque Nacional de Fiordland para embarcar y surcar las sorprendentes aguas azules de Milford Sound. Tenga su cámara a mano mientras navega por el fiordo y admira maravillas naturales como la cascada Bowen Falls con 160 metros (525 pies) de altura, el espectacular valle colgante de Sinbad Gully y el pico nevado de Mount Pembroke. Suba a la plataforma mirador del barco para tener una vista mejor de la fauna salvaje local, como las colonias de lobos marinos, las manadas de delfines oscuros y los peculiares pingüinos crestados de los fiordos. Mientras continúa hacia la costa del mar de Tasmania, pasará a los pies del emblemático Mitre Peak con 1692 metros (5551 pies), uno de los lugares de interés más fotografiados de Nueva Zelanda. De regreso a Milford Sound, experimentará la espectacular visión de los primeros pobladores a finales del siglo XVIII y escuchará historias sobre su viaje contadas por el guía que le acompañará a bordo. Después de dos horas en el agua, regresará a la costa de vuelta al centro de visitantes de Milford Sound, donde termina el recorrido. Amazing! Thoroughly enjoyed this cruise. We were taken right up close to sedl rock, we could almost touch the seals. And also under the waterfall. A good soaking! Up close and personal - fantastic. Thank you Mitre Peak Cruises. Great trip in a smaller boat. Able to get close to everything. Great crew. Our trip was fantastic. We had perfect weather. The crew was friendly, The boat was un crowded. It was a very wet day when we went but that was good as we got to see lots of waterfalls. Our captain got us very close to the waterfalls and we got to see a few seals. It was a lovely way to spend a few hours. We loved this tour because it was on the smallest boat, which made it more flexible and close-up to waterfalls. Also we booked the first tour of the day, which meant it wasn't full, so there was much room to move around on the boat. And luckily, we had gorgeous weather, so it was pretty perfect! Had booked ahead but we missed our boat. Recommend to allow an extra 30 minutes if you drive to be on the safe side. The young man at check in was terrific. Gave us a jaffa and a she'll be right and we were on the next boat within a hour with no extra charge. We had beautiful weather and got in close to all the highlights. The driver gave very informative commentary. I had understood no food or drink or the boat apart from the complimentary tea and coffee but that actually meant none served. Passengers are allowed to bring their own and eat on the boat which is nice if you are going out around lunchtime. 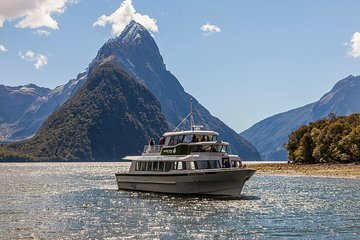 What a great day out, we booked with Mitre Peak cruises because they were a smaller boat and because all the tourist buses went on the larger vessels, Great tip from a friend who previously went on this cruise, Great boat with lots of viewing areas and staff were very friendly. The day of our trip to Milford Sound it had rained continuously for over 12 hours and continued right throughout our cruise. In total 175mm of rain was deposited in Fiordland. However, this in no eay detracted from the beauty and majesty of the wonderful sights we were privileged to see. If anything it enhanced our cruise as the skipper of the boat told us that the waterfalls on one side of the Sound were only there because of the rain. Unfortunately, we were only on a little boat and the skipper had to turn it around earlier in the cruise than normal, thereby not making it into the Tasmin Sea. The weather being as it was, this was a good decision!